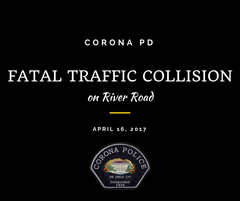 On Saturday, April 15, 2017 at 11:07 p.m., the Corona Police Department and the Corona Fire Department responded to a traffic collision involving a motorcyclist at River Road and Cota Street. Upon arrival, Corona Fire Paramedics pronounced the motorcyclist deceased. Subsequently, River Road was closed to traffic in both directions between Cota Street and Main Street for an investigation. Based on witness statements and evidence at the scene, the motorcyclist was traveling east on River Road at an unknown speed. The motorcyclist crossed the intersection at Cota Street when the motorcyclist hit the south curb line and two trees. The Riverside County Sheriff-Coroner’s Office has not identified the male adult. The Corona Police Department's Collision Response Team is handling the investigation. At this time, it is unknown if drugs or alcohol were a factor. Anyone with information about this collision is encouraged to contact Traffic Investigator Clark Eveland at 951-817-5764.